part of STIMULATE's 10Year Anniversary month! Metropoils Records Recording Artist returns to STIMULATE! supporting Raymond Watts new album "RISEN"
Raymond Wattsnd Watt, better known to the industrial music scene as PIG, continues to ride high on the hog; having returned from a long period of inactivity with 2016’s "The Gospel", followed by an extensive touring period, a remix album, and CD and vinyl EP releases, this year marked the release of a new album, "Risen". With this latest outing, the prolific purveyor of perversion delivers unto his audience some of his most accomplished and stylistically assorted material as tracks like “Prey & Obey,” “The Revelation,” “The Chosen Few,” and “The Vice Girls” stand as modern industrial/rock classics sure to please the disorderly disciples. There will be hell to pay in the U.S.A. as PIG embarks on a tour this September. Demanding that his disciples prey and obey to the pulpit of pork, the mighty swine Raymond Watts speaks: Some Messiahs deliver their Gospel, hang out for a long weekend & then leave the rest to the followers. The Lord Of The Lard calls on Ben Christo, Z.Marr, En Esch, Tim Skold, Marc Heal, Phil Barry, Mark Thwaite, Anita Sylph & Emre Ramazanoglu & gets to work on bringing glam to the damned. "Risen" is the unadulterated & driven sound of pure , adorned only by the poetry Raymond Watts provides. OUR BIG STIMULATE 10 YEAR ANNIVERSARY MONTH!! ►9/2: STIMULATE 9/2: LaborDay Wknd Special/FetishTribe Anniv 3 Floors! 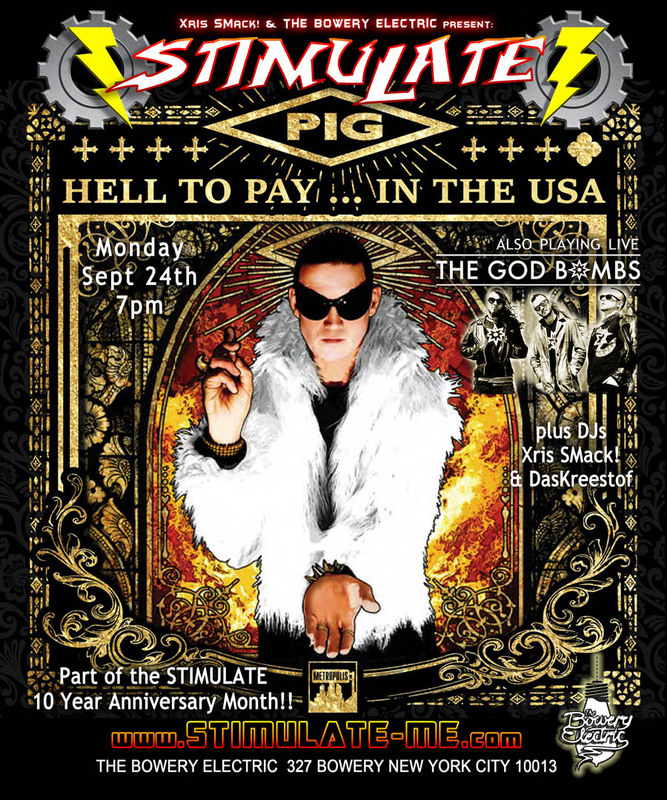 ►9/22: STIMULATE 10 Year Anniversary & Gary Numan Aftershow party! Please RSVP and SAVE THE DATES to celebrate with us!!! :DasKreestof, Industrial, Industrial rock, KMFM, Metropolis Records, PIG, Raymond Watts, Xris SMack!